Project Night Sky is dedicated to promote the preservation of the night skies and assist others with the good practice of efficient lighting. Sky Glow...light wastefully escaping into the night sky and causing a glow over urban/suburban areas. Glare...light shining dangerously out into peoples eyes as they walk or drive by. Light Trespass...unwanted light shining onto a neighbours property or into their home. Light pollution is a worldwide problem and to preserve the night sky many organisations such as the International Dark Sky Association (IDA) came into being, together with other organisations such as the Side Walk Astronomers, and also campaigns like National Dark Sky Week. 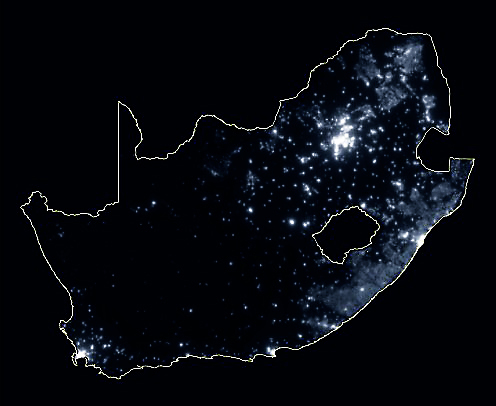 South Africa also experiences high levels of light pollution in the major centres of the country and even in the outlying areas. 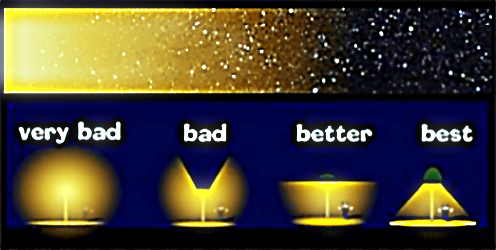 Although it is everybody's responsibility, the amateur astronomer can play an important role in reducing light pollution through public awareness. If you belong to an astronomy club, attempt building such awareness into your public presentations and materials. You can even host evenings around the concept of dark skies, in very creative ways. For example switch on all the outdoor lights and show visitors the effect when switching them off. If you are associated with an observatory, invite people living nearby for a free evening at the observatory. You can also register with a dark sky association. So now you ask what you can do about it, well the answer is simple. Two basic principles that seem like common sense but which most of us haven't had reason to pay much attention to in the past: Use the right amount of light, and use it only when and where it's needed. Each one of us can contribute to the reduction of Light Pollution in our own ways. First, by making sure that our exterior lighting is ordinance compliant lighting. By this, is meant that they only light the ground beneath them and never shine across onto a neighbouring property, or into the night sky. Secondly, by making sure that your outdoor lights are only on when needed. By this, is meant that they're only on when there is activity in the area. Dusk to dawn lighting is to be strictly avoided. Thirdly, reduce the wattage of your bulbs. Image credit above: KARSTEN DRESCHER (Pr. Sci. Nat. ); from the light pollution modelling done in 2006 and published in Vector Magazine, EE Publishers (online), October 2006 (p26). The human eye is remarkable in its ability to adapt to the amount of light present. Too much light can be overwhelming and glaring actually reduces visibility. Even a small reduction in wattage will reduce light pollution. You might be surprised with how well you can see at night with a reduced wattage. Try it out and see what works for you. MYTH: The brighter the better - WRONG! FACT: The human eye responds differently to low levels of illumination than to high levels of illumination. When levels of illumination are low, the human eye adapts and becomes much more sensitive to the available light. Ever wonder why your bedroom seems so dark when you first turn off the lights and then, after about 20 minutes or so, the room seems much brighter? This is called "dark adaption" or "night vision". Constant and uniform levels of nighttime lighting at a moderately low level provide the best all-round visibility of your surroundings. Light which can be seen coming directly from exposed lamps destroys night vision, causes "blinding" glare, and wastes energy, allowing light to reach the sky instead of the ground. MYTH: Bright lights enhance public safety - WRONG! FACT: Unshielded bright lights create extreme levels of contrast by producing areas of dark shadows adjacent to areas of intense glare. Studies have shown that brightly illuminated areas having a dark perimeter (the area you see with your back to the light) are less safe than the same area having no artificial light source whatsoever! Both glare and deep shadow obscure your vision - a very unsafe situation. MYTH: All lights are the same - WRONG! FACT: Outdoor lamps which allow light to shine above the horizon are wasteful of energy, and since they use electricity, they indirectly contribute to the production of greenhouse gases, notably carbon dioxide. Unshielded lights produce glare that contributes to "light-trespass" (the shining of unwanted light onto neighbouring properties) and cause poor visual adaptation. Properly shielded lights can use less wattage to attain the same ground level illumination, thereby saving energy costs. Using less energy also means producing lower levels of greenhouse gases from fossil fueled electrical power generation stations. MYTH: Cheap lights save money - WRONG! FACT: Highly illuminated urban areas are known to confuse transient migrating birds and to upset the natural survival rhythms of many nocturnal animals. Light pollution also causes stars to be "lost" in the bright background, effectively destroying our ability to see the natural beauty of the night sky. MYTH: Nobody really cares about the night sky - WRONG! FACT: Well shielded lights, which reflect all light to the ground and cut-off horizontal glare, require lower wattage bulbs to achieve the same level of ground illumination as lights which allow extraneous light to escape into the sky. In the long run, the extra money invested in well-designed lighting fixtures more than pays back the investment, because of much lower long-term energy costs.